iOS 10 includes support for Apple Pay on the web, allowing users to make purchases from websites using Apple's payment service and Touch ID fingerprint authentication. Now that iOS 10 is available to the public, websites have started rolling out support for the Apple Pay on the web feature. Time Inc. today announced that its customers are now able to use Apple Pay to purchase subscriptions for its line of magazines, including Sports Illustrated, People, Entertainment Weekly, and Real Simple. Last week, online retailer Wayfair announced support for Apple Pay on the web, giving shoppers an option to pay for furniture and home décor products through Apple Pay. Apple, of course, is accepting Apple Pay on its website too. 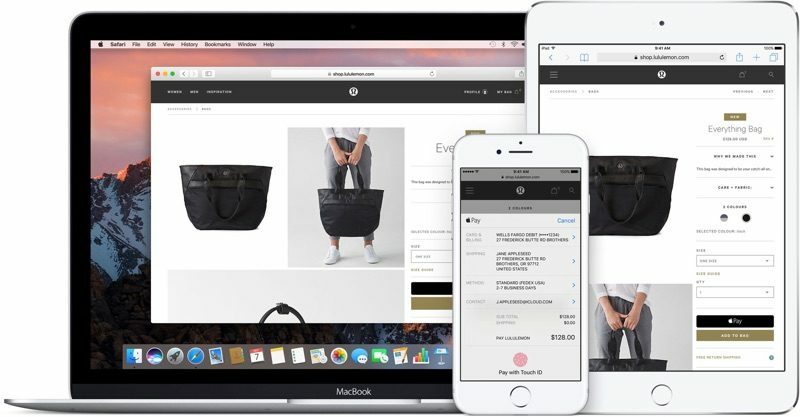 Backend payment services including Big Commerce, Shopify, Stripe, and Squarespace have all announced support for Apple Pay on the web, giving smaller merchants an easy way to accept Apple Pay payments for purchases. In the coming weeks, we should see Apple Pay rolling out to many websites, giving customers an alternative to existing payment services like PayPal. With Apple Pay, purchases can be made with a single touch, and there's no need to enter credit card or shipping details. Apple Pay is also secure, keeping card numbers and other personal information out of the hands of vendors. When macOS Sierra is released to the public next Tuesday, Apple Pay on the web will also be available on the Mac. As with Apple Pay on the iPhone, purchases will be authenticated through a connection with an iPhone 6 or later or an authenticated Apple Watch. According to Apple, macOS Sierra's Apple Pay on the web feature will be available to all customers who have a Handoff-enabled Mac that is able to run the Sierra operating system. On mobile devices, Apple Pay on the web is available on the iPhone 6 and later, the iPad Pro, the iPad Air 2, and the iPad mini 3 and later. I don't understand how this works. There's no Touch ID on my Macs (yet), so what happens, I try to buy something in the browser and it sends a notification to my iPhone? Then I Touch ID the phone and it notifies the website? I'm feeling this planned obsolescence is getting more aggressive with apple why not implement it on a 5s? they have a touch ID too? In terms of iPhone and iPads, Apple Pay requires both Touch ID and the Secure Element ('https://support.apple.com/en-us/HT203027'), which the 5S lacks (it has Touch ID and the older Secure Enclave, which only holds Health data and Touch ID). Because of this, you could verify your identity, but your card data would still need to be stored somewhere. This is where an iPhone (presumably 6/6S/SE/7) or Apple Watch with Apple Pay will work in tandem with your Mac. I don't see why they couldn't allow an iPad with Apple Pay to conduct the transaction, or an Apple Watch for in-app purchases on older devices, but that muddies the water a bit from the old matrix of "iPad = in-app only, iPhone = in-app and in-store, Watch = in-store"
Arguably, the 5S is an excellent older phone, but some of the features do require hardware, not just software. I just wish the rollout would be quicker worldwide. In the Czech Republic, contactless payments have been used for years as they are most of Europe, not sure if it's the legislation or just deals with banks. When I was in Prague I used it twice. Both times the people were amazed that I paid with my phone. So it definitely works with US cards; I think it's the bank side of things that need to be worked out. Been waiting for this all summer through all the beta testing. Pay, pay, pay, buy, buy, buy. I can't blame apple for making money. I guess money grows on trees. Correct. Either your phone or watch.